The Holloway Street school was built in 1928, designed by Durham architects Rose and Rose. Rear wings were added to the school in 1950 and 1954. A gymnasium was added in 1975. I was a first grader at Holloway Street School, 1960-1961. My first teacher was Miss Richmond, she left shortly thereafter, and then I was in Mrs. Rhew's first grade class. My second grade teacher was Mrs. Underwood. I transferred to Bethesda school when we moved from Wellons Village to Lumley Road. For what it's worth, this was during segregated times, Holloway Street School was 100% white at that time. They closed Holloway and East End Elementaries then combined them into a new Eastway Elem. Really creative with the name, huh! I attended Holloway Street Elementary School from 1948 - 1954. My first grade teacher was Miss Franklin. The principal was Mrs. Swindell. (Sorry, I never knew their first names. Children didn't in those days.) My mother was an active member of the PTA and was instrumental in creating many fund raisers. I remember a Tom Thumb wedding, talent shows, minstral shows and nickle movies on Friday afternoons. I always wanted to be a safety patrol, but alas, only boys could do that before women's rights happened. Holloway Street School had lots of community support and even more community spirit. It was a lovely place to grow up. 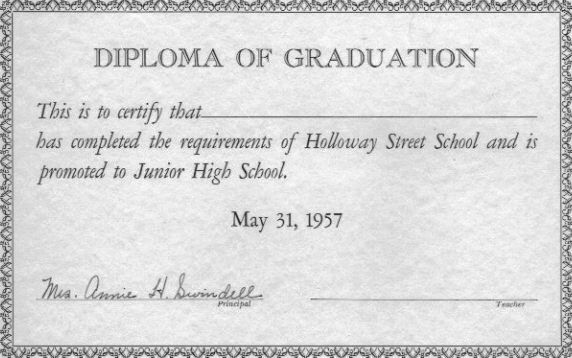 I attended Holloway Street Elementary School from Sep 1951 thru Jun 1957. As I remember them these were my elementary school teachers: 1st - Mrs. Rhew, 2nd - Mrs. Means, 3rd - Miss Brittain (married that year and became Mrs. Townsend), 4th - Miss Harrell, 5th - Miss Timberlake, 6th - Mrs. Wilkinson. My family moved out of the district when I was in the 5th grade, but I was allowed to complete elementary school at Holloway Street the following year. During the 5th and 6th grades I was in the Safety Patrol; the busiest street I had to "patrol" was the corner of Holloway and Alston Ave.
Evidently Mrs. Rhew taught many of us -- very strict but excellent. I also remember Mrs. Swindell fondly. When she retired in about 1961, each class presented her with a bouquet of money offered at an assembly. I wish I could remember the total, but as a child I thought she must be a millionaire. I loved field day in the spring running up and down what I thought was a gigantic hill on the side and kickball on the asphalt playground. Mrs. Crutchfield was the cafeteria manager, and I think lunch was 25 cents, but I may be wrong about that low price. Mrs. Nagy, Mrs. White, Mrs. McArthur, and Mrs. Kneriman also taught there. I was in Mrs. McArthur's classroom in 1963 when President Kennedy's death was announced on the intercom. I'm glad some organizations still use the building, and I hope it is never demolished. Wow... what memories... 50 years later. I remember my dad voting very early on Election Day November 1960, and dropping me by my first grade class - I was there even before Mrs. Rhew. She asked me who he voted for. I said "Richard Nixon", and she gave me a dirty look. A rare breach of professionalism on her part. BTW, my 2nd grade teacher was Mrs. Nagy (after a little research of my ancient archive of report cards). Just looked at the picture of the kids and came across the name, Sammy Winston, whom I worked with at Central Carolina Bank. Such a nice guy. My grammar school was Fuller and graduated from DHS in 1952. I attended Holloway St. Elementary from 1959 to 1962 (grades 1-4) before we moved to Wilmington. Mrs. Rhew was my first grade teacher. I had Mrs. Beard in 2nd grade, Mrs. Richmond in 3rd, and Mrs. Etgen in 4th. Mrs. Etgen was very young at that time, and I think she was new that year. I remember her as being very tall and slender and very pretty! I remember having a big snow storm in 1st grade, and school was closed for several days. The first day back, they could only get 1 door open on the side of the building. All the other doors were snowed and iced shut. I have some very good memories of the school and still remember a number of my classmates. 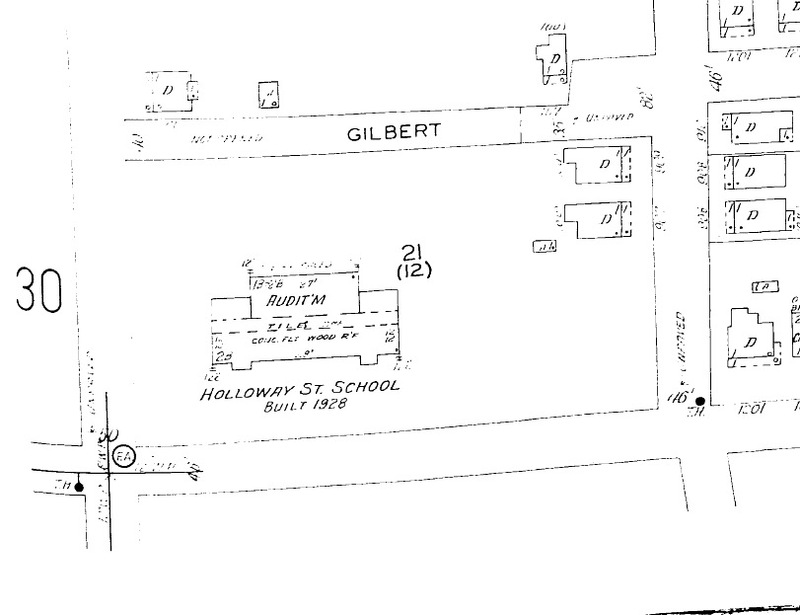 I was at Holloway Street for 5th and 6th grades in 1950-52. Miss Carlotta Autrey was my fifth grade teacher and Mrs. Mabel ......oh, dear, cannot recall her last name. That's odd that I can remember her first name when we certainly called her Mrs. ________. I remember her telling us about horribly long tapeworms she had seen. I think her parents had been missionaries. It was a lovely time and a very nice school. I attended Holloway Street School from 1945-1950 Teachers were Ms Currin( later Mrs Rhew) Ms Alexander, Ms Holloway, Ms Petty 4th and 6th and Mrs Whitehead Great days at this school. Mrs Annie Swindell was the principal. I was Captain of Safety Patrol as were my two brothers. I entered first grade at Hooloway Street in the autumn of 1949 and completed first and second grade there. My family then moved. I have fond general memories of my time there, but specifics now elude me. I would love to see class lists from my years there. 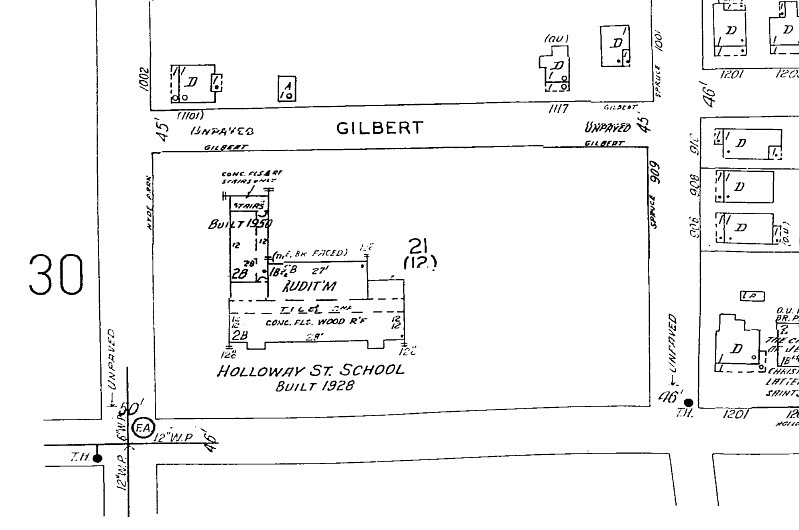 1950 Sanborn Map, showing the 1950 addition. I can find little to no information about the school in books or public records; I'll ask that any alums or knowledgeable folks out there chime in with information about the school. 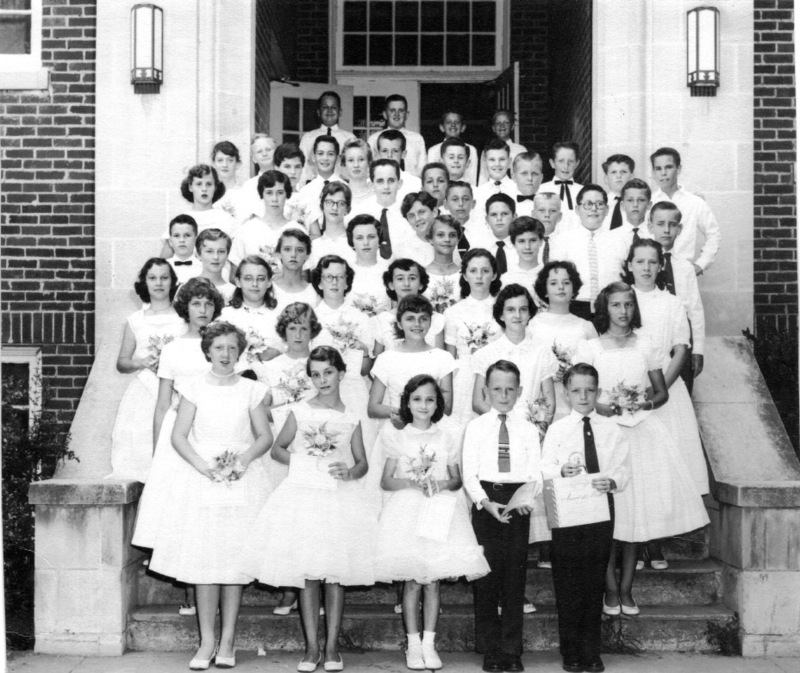 Barbara Warren Loftin sent the following picture of her graduating class of May 31, 1957. I'm unsure of when it closed. My best guess would be mid-1990s, and that it was replaced by Eastway Elementary. 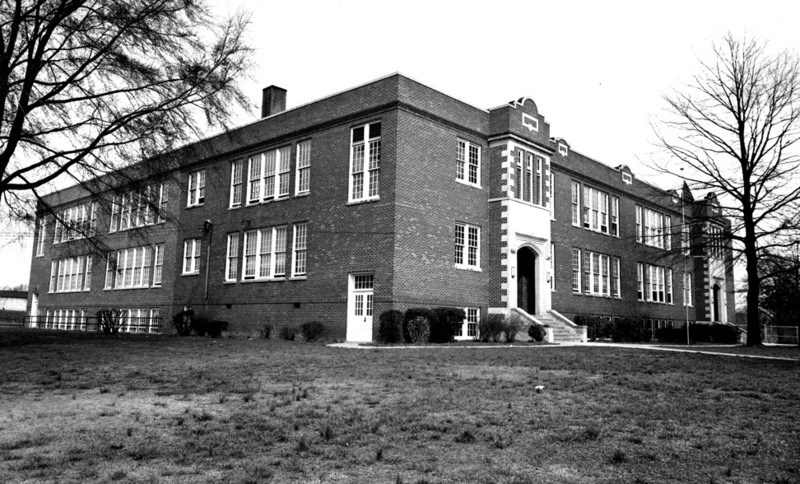 In 2000, Durham Public Schools offered the building to Durham County for $898,000; the county declined. In October 2001, the Durham Public Schools sold the building to "Techno Complex, LLC" - hard to deduce the purchase price from the deeds, as it's revenue-stamp exempt. It appears to have been used / is being leased by various community non-profit / training / church type tenants - the building was for sale in ~2008-9, but the listing appears to have expired.